To apply for SNAP benefits, please call the hotline to speak to a SNAP coordinator. The hotline number is: 855-444-5556. A coordinator will walk you through the application process, help you determine if you or your family meet the income guidelines for food assistance and provide information about using the SNAP EBT card. Supplemental Nutrition Assistance Program (SNAP), is the largest federal food assistance program. It provides about 46 million Americans in around 22 million low-income homes with pre-loaded debit cards to purchase food to feed themselves and their families. It was formerly called the Food Stamp Program. The SNAP Outreach Program in Nebraska is a cooperative effort through Food Bank of Lincoln and Food Bank for the Heartland (Omaha) and the Iowa Food Bank Association. It is made possible through grant funding from the Walmart Foundation, Telligen Community Initiative and Feeding America. SNAP Outreach provides SNAP education to individuals and communities and provides application assistance to eligible Nebraskans. SNAP offers another means of providing meals to individuals and families that struggle with hunger in our community. Participants include adults with families who work in low-wage jobs, unemployed workers, and people on fixed incomes, such as Social Security. About three-fourths of SNAP recipients live in households with children; more than one-quarter live in households with seniors or people with disabilities. SNAP helps low-income individuals and families buy the food they need. Unfortunately, about one-third of the eligible population does not take advantage of this benefit. Food Bank of Lincoln’s goal is to increase SNAP participation in Nebraska by helping the eligible population access this valuable nutrition assistance benefit. SNAP participation has positive economic impact in communities – $9 in total spending is generated for every $5 in new SNAP benefits. Awareness– We can provide print and electronic resources to you for distribution to your clients. This information is designed to educate and encourage them to apply for SNAP if they qualify. Assistance– Our SNAP Outreach Coordinators are available to directly assist clients with the prescreening, application, interview and verification process via a toll-free hotline. Access– The Permanent Access Site program offered by Food Bank of Lincoln/Food Bank of the Heartland provides your agency with a computer for public use in applying for benefits and training for your staff to assist with the application process. Your SNAP partnership with Food Bank of Lincoln/Food Bank of the Heartland helps you reach people who need help in your community. 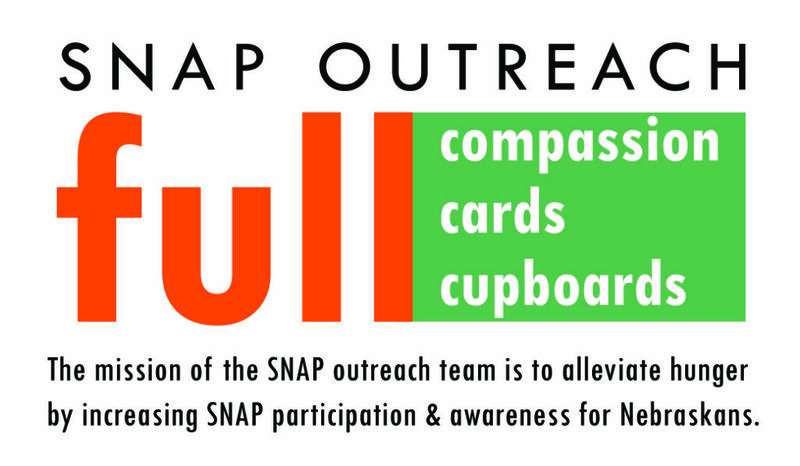 Distribute SNAP materials provided by Food Bank of Lincoln/Food Bank of the Heartland to your clients. Partner with Food Bank of Lincoln/Food Bank of the Heartland as a permanent access site. For more information, please contact a SNAP Outreach Coordinator at 855-444-5556.